and the nights are made for sleeping. This reminds me of the fall weather at home. By the time this reaches Washington you will probably be in the Drip saddle. Did you fathom the Jersey drawl? While in New York I found their speech strange. Course no spuds are better than none, but, I sure would like to see the guy who dehydrated the first Irish potatoe. The cabbage and onion contain the strong oder but the taste is lost along the belt. A good meal is my main desire. Not much traffic at night but I still sling on the gun and stand the 20-24 watch this evening. Points? Ha! - me, I don't have enough. 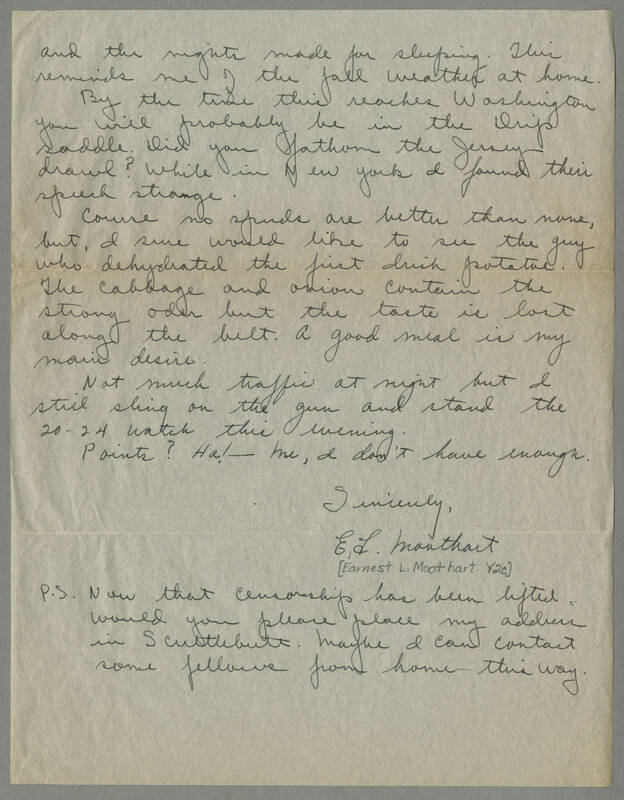 Sincerely, E.L. Moothart [Earnest L. Moothart Y2C] P.S. Now that censorship has been lifted, would you please place my address in Scuttlebutt. Maybe I can contact some fellows from home this way.